Meteorology is the scientific study of the atmosphere, especially weather and climate. Do you know what the atmosphere is? The atmosphere is a gaseous envelope that surrounds the earth and is held to it by gravity. The main components of the atmosphere are: oxygen, nitrogen, carbon dioxide, water vapour, the rare gases and others aerosols. How would you define climate? Climate is the average of weather over at least a 30-year period. The climate taken over different periods of time, for example 30 years, 100, 1000 years may be different. Weather is the continuously changing atmosphere lasting for minutes and weeks. Climate is the average weather over a given period of time. Climate is what we expect and weather is what we get. What do you understand by climate change? Climate change is the change in the state of the climate that can be identified by changes in the mean and/or variability of its properties and is typically measured over several decades or longer. The change may be due to natural or human-induced causes. Atmospheric pressure is the weight of a column of air per square metre. The unit of pressure in meteorology is the millibar or the Hectopascal (hPa.). Pressure is measured by an instrument called a barometer. A body of air whose temperature and humidity characteristics remain relatively constant over a horizontal distance of hundreds to thousands of kilometers. Air masses develop their climatic characteristics by remaining stationary over a source region for a number of days. Air masses are classified according to their temperature and humidity characteristics. The tropic of Capricorn is an imaginary line near latitude of 23.5° south. This is the Southern limit of the Sun’s declination. The tropic of Cancer lies near latitude of 23.5° north. Trade winds are southeasterly surface winds that generally blow from the subtropical high pressure zone. The Sea Breeze is a local wind, which blows from the sea to the land on a warm or hot sunny day. It is caused by the difference in heating between the land and the sea, since for the same amount of heat energy the land soon becomes hotter than the sea. At night the land becomes cooler than the sea, and the circulation is reversed with the flow of air from the land to the sea. This is called the land breeze and it is usually lighter then the Sea Breeze. What is a zone of disturbed weather? What is the difference between a tropical disturbance and a tropical depression? Is there a difference between moderate tropical storm and a severe tropical storm? In a moderate tropical storm, the estimated wind speed is between 63 to 88 km/h and the wind speed is in the range 80 to 117 km/h in a severe tropical storm. Is there a difference between extratropical depression and subtropical depression? Is it true that most cyclones hit Mauritius during weekends and public holidays? An anticyclone is an area of high atmospheric and outward blowing wind in a counter – clockwise direction in the southern hemisphere. A cold front is the leading edge of a cold air mass as it moves towards warmer air. 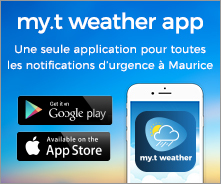 A cold front crossing Mauritius is usually accompanied by showers and strengthening of the wind from the southeast. After the passage of the front there is a drop in temperature and humidity. Define wind and what causes the wind? measure the wind speed and direction. Isobars are lines of equal pressure. What is difference between El Niño and La Niña? It is the short form for El Niño-Southern Oscillation. El Niño is the abnormal warming of the oceans in the equatorial eastern and central Pacific and the Southern Oscillation refers to the changes in atmospheric pressure between Darwin and Tahiti. Cumulonimbus clouds have high vertical extent reaching up to 12 km high. Warm, moist rising air with a high enough velocity causes the electric charges of the particles to separate; the positive charges concentrate at the top and the negative charges at the base of the clouds. When these charges come into contact, they produce electrical discharges and huge sparks or thunderbolts, lightning is visible and seconds after a rumbling sound, thunder is heard. The lightning is seen before the thunder is heard because light travels faster than sound. In which months do we have thunderstorms in Mauritius? Thunder occurs in Mauritius mostly during the period December through April. However, on rare occasions, thunderstorms occur in May and June as well. The winter season generally does not favour the formation of thunder clouds. What precautions do need to take when there is a thunderstorms? Be on the lookout for darkening skies, lightning and increasing winds. These are precursors of a thunderstorm. Pay heed to the weather forecasts. Don’t wait for the rain to begin. If you hear thunder, go to a safe place immediately. If you are at sea, rush to the shore and find a shelter immediately. If you are in a vehicle, stay inside. Don’t touch any metallic parts. Do not take shower, wash hands, dishes or do laundry. Stay out of water as it is a good conductor of electricity. Disconnect all electrical appliances at home or in the office. Don’t use the corded telephone. Mobile phone is safer. Stay off porches and away from doors and windows. Wind is the horizontal movement of the air. The atmosphere tends to maintain an equal pressure over the entire earth just as the oceans tends to maintain a constant level. When the equilibrium is disturbed air begins to flow from areas of higher pressure to areas of lower pressure. The main force that creates wind is the difference in pressure from place to place, named as Pressure Gradient Force. The larger the pressure difference, the stronger is the wind and smaller the pressure difference, lighter is the wind. An anemometer is an instrument to measure the wind speed and direction. What does MJO stands for? The Madden-Julian Oscillation (MJO) is a wave that moves eastwards around the tropics with a cycle of 30 to 60 days. MJO has a wide range of impacts, namely changes in precipitation patterns, atmospheric circulations and surface temperature around the tropics and the sub tropics. The MJO is often variable, with periods of moderate to strong activity followed by periods of little or no activity. A weather forecast is an estimation based on special knowledge of the future state of the atmosphere with respect to temperature, precipitation, and wind. Weather forecasts are now routinely provided for up to 3 days in advance for local purposes. Global weather models are capable of predicting weather for up to 14 days in advance. Greenhouse gases are such gases as water vapor, carbon dioxide, and methane that trap heat more effectively, thus affecting the Earth’s surface temperature. What do you understand by greenhouse effect? The atmosphere allows solar radiation to reach the earth relatively easily. The atmosphere absorbs the infrared radiation emitted by the Earth’s surface and radiates it back to the Earth in much the same way a greenhouse traps heat as the sun’s rays pass through the glass, and the heat generated does not pass back through the glass. The “greenhouse effect” causes the surface of the Earth to be much warmer than it would be without the atmosphere.